CMT Solid Carbide Up and Downcut Spiral Bit - 1/2"
Good clean cutting with efficient chip ejection. Cooler running equal longer lasting edge. Up and downcut in the one bit. 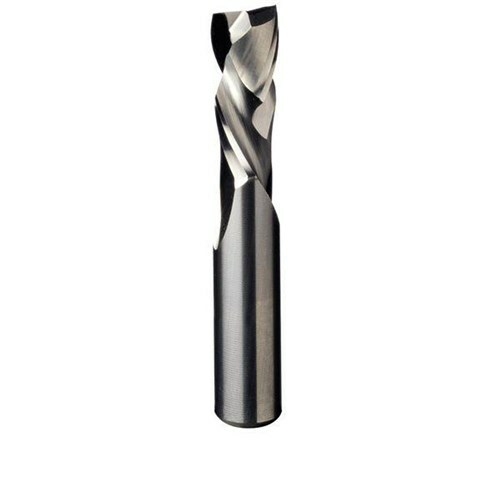 CMT have created a new special super micrograin carbide in order to create and maintain a keen cutting edge. The low angle spiral was chosen to give a shear cutting action giving a clean cut and good chip ejection, with the added benefit of cool running helping to make the edge last that little bit longer. Ideally used with machining centres, point to point machines, CNC routers and hand-held routers equipped with chucks or adaptors, where the workpiece is securely clamped as a high feed rate is recommended. Used for cutting, copying, panel sizing and any routing applications on solid wood, wood composites, plastic materials and laminates. An overall cutting length has been split into both upcut and downcut orientations, giving the shear cut of the spiral profile the correct direction for both top and bottom edges. The end 16mm has the opposite action to the top rest of the spiral, giving both up and down spiral action.